If you’ve read my blog long enough, you’d have an idea on how much I love cooking and eating pasta. Oftentimes, I’m happy just having it alone. But then there are times when it must have a partner dish. Without a doubt, pizza is one of them. I don’t mind ordering from pizzerias and chains. But the truth is, ordering often can be costly. And what I don’t like so much is not having enough control on what and how toppings are put — even if the store allows you to choose them. So for me, homemade is still the way to go. Still, one would have to deal with the biggest hurdle — making the pizza crust. I have yet to see good store-bought crust worth recommending. And it is time consuming to make the crust from scratch. Of course, I’ve tried bread in the past — with the baguette or the local pandesal. But they still come out different. So just today, I tried out something new: puff pastry as a pizza crust. I had excess puff pastry sheets from last week, when I only needed to use one out of five sheets for my baked camembert recipe. I thought to myself, “Why didn’t I think of that before?” How I wish I realized this several years back. Puff Pastry Sheets are available in the grocery. 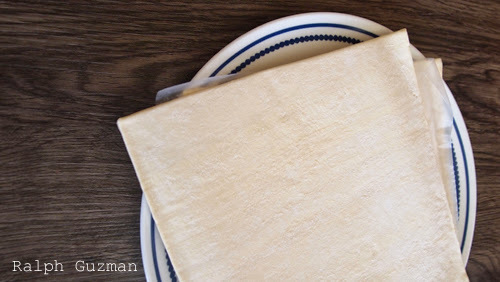 This one is 8×8 inches, which is perfect for four slices of pizza– good for 2 people. It’s very convenient to use puff pastry sheets. No more using the rolling pin, no more kneading, etc. It’s already a perfect square. To make sure there is a good degree of crunch, I lightly brushed the sheet with olive oil. I then proceeded to spreading tomato paste. I did a very thin layer, as putting to much paste would make the crust soggy. Then I put parmesan cheese (I’d put mozzarella if it were available). I put chopped sausage, grated vintage cheddar, a few teaspoons of cream cheese here and there, and a few pineapple tidbits. I made sure to drain all the excess juices from the pineapple first. 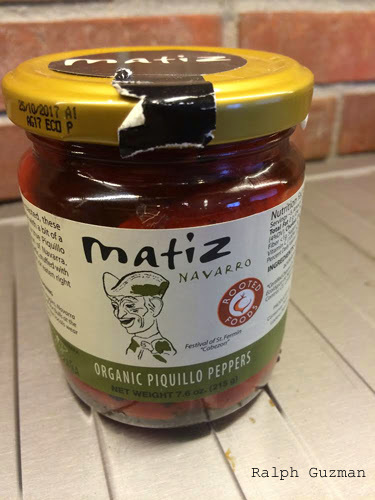 Finally, I added a few pieces piquillo peppers. They’re very flavorful, and they balance the richness of the cream cheese. Add pepper. Oh, and I still spread out a pinch of salt. I placed it in the oven at 175 C (350 F) for 15 minutes. I actually used my oven toaster for this. My wife and I I love it. It’s the Smart Oven from Breville, which actually has a pizza function. Very smart. Perhaps, I should write about it one of these days. After taking it out of the oven, I topped the pizza arugula. Aside from adding flavor, it gives good color to the pizza, completing the red, white, and green. 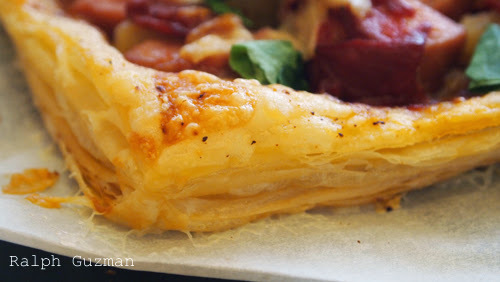 I loved how the puff pastry increased in volume– how if puffed up, yes. And while purists would say a puff pastry crust is still different from the traditional crust, I loved the flaky crunch it has, which is wonderful with pizza. At the end of the day, if you choose good puff pastry, the crust will not taste store-bought,jo and that’s what counts. Notice how the pastry went from flat to puffy. 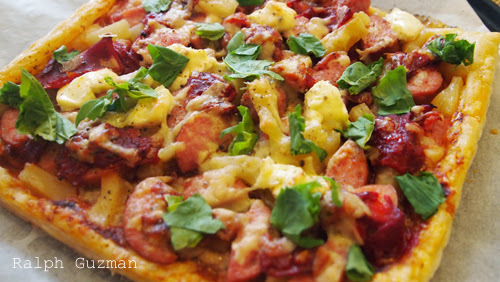 This entry was posted in Food + Recipes, Pizza! and tagged Italian Recipe, Pizza, Pizza with Puff Pastry, Puff Pastry, Puff Pastry Pizza, Puff Pastry Pizza Crust, Puff Pastry Pizza Recipe, Puff Pastry Recipes by Ralph. Bookmark the permalink.